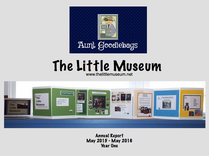 The Little Museum - Aunt Goodiebags! 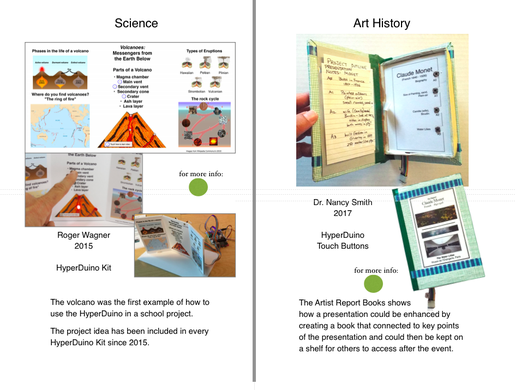 We will soon be adding an interactive museum display that will highlight HyperDuino Projects! These are two of the museum panels. When it is active you will be able to click on the green dots for more information. I am also planning a mini Library of HyperDuino HowTos and other Art and Museum HowTos. You can click on a book cover and go to a book I made using Book Creator for Chrome. This book is a test to be sure this will work! You can leave me a note or comment/suggestion on the form at the bottom of this page. 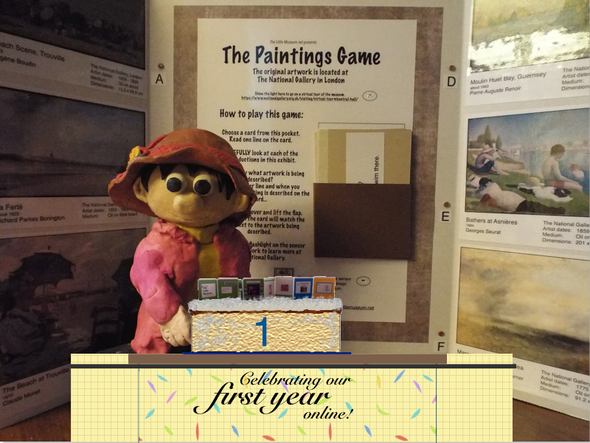 The Little Museum marked our FIRST year on the Internet with a virtual party! Hope you liked the cake! and uses HyperDuino to make the actual exhibit boards interactive. enhance the work by connecting to information at the National Gallery of Art in London. Here is a 2-minute video to give you a quick overview of the HyperDuino/HyperStudio project. 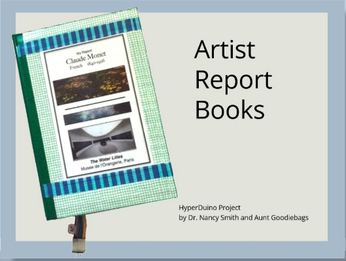 We decided to create an "Annual Report"-- just like a "big" museum. Click on the image or use this link http://bit.ly/2rus55C to see the report. We used the Book Creator app for iPad to create the document and exported it as a PDF. 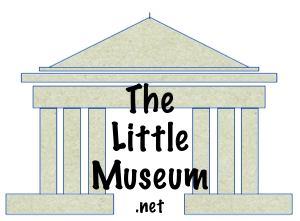 Auntie designed The Little Museum as a HyperDuino project that was shown at ISTE 2015 in Philadelphia. Touching sensors on the panels connected to additional information that was shown on a computer. (Pre-K through 6th Grade and my college students). After selecting a reproduction, the student would create a list of words and phrases to describe the artwork. The student then chose four short lines to describe the work-- but not give too much information (keep reading-- you will understand). Each reproduction in the exhibit (bulletin board) had an identifying letter. (under a flap on the back of the card). Students visiting the exhibit would take a card, read the words and carefully LOOK at the reproductions and choose the work they thought was being described on the card. Turning the card over and lifting the flap would show if their selection was correct. I tried to offer reproductions that were of a specific theme and included several works that were similar so that the students would have to choose their words carefully. Students would often discuss the works on exhibit and compare what made one work different from another (I did not expect this! It made me smile every time I overheard these conversations.). Older students volunteered to read descriptions to younger students to help them play the game. It was a huge success! The "correct" answer was less important than the discussions and careful looking! 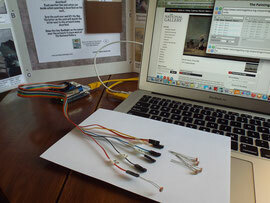 HyperDuino for Chrome allows you to connect sensors and LEDs to a display that can then connect to a webpage or YouTube video. HyperDuino is an exciting addition to the S.T.E.M. movement. This also fits right in with Auntie's push to ADD THE "A" (ART) into S.T.E.M. (Science, Technology, Electronics, Math) -- to create S.T.E.A.M. HyperDuino is a tiny computer "shield" that fits onto an Arduino. Check out those rainbow wires! Tiny LEDs and sensors! What is not to like??? We plan to post small descriptions and explanations here over the next few weeks. 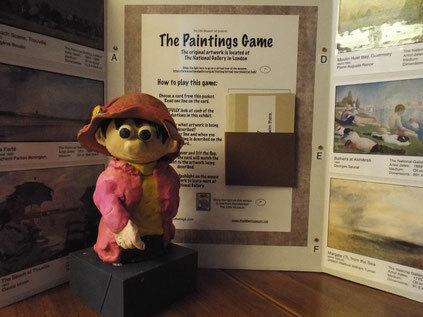 We hope you will visit the webpages of The National Gallery in London. 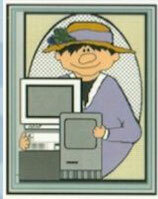 They have some amazing resources available. You can even see art on exhibit in the galleries! (NOTE: The reproductions in The Little Museum exhibits all appear to be the same size. (click on the links at the bottom of the page to like and follow). We hope to add enough HowTos here to inspire you to create your own Little Museum! and... You can always leave a message or question by using this form!